Here we have a Seth Thomas #2 wall clock. Nice oak case. The clock was badly in need of maintenance. The clock has been stored for a number of years, the suspension rod was badly bent, suspension spring was broken, pivot holes were warn, broken weight cable, and the pendulum bob needed a little polish. 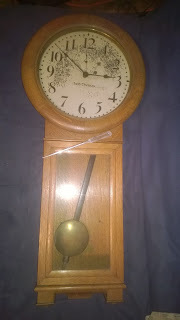 The clock was missing the weight, pulley, and key. The movement removed from the case. WOW look at all the years of dust and dirt. This was easily removed. An initial cleaning revealed a number of pivot holes that were warn. This was repaired. After all the work completed, the movement was cleaned with hi-grade clock cleaning solution in an ultrasonic cleaner. In this image the RED circled pivot holes were warn and were repaired. Notice the bent crutch. This was repaired in the image on the right. Urgos Chime Movement - Mainspring End Repair In for repair is a Westminster Chime mantle clock. The customer stated that the clock does not strike the hour otherwise the clock runs fine. The strike winding arbor does turn but would never feel like the spring was getting wound. There is only one reason for this; The mainspring is broken. 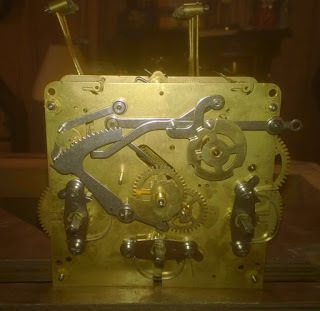 The clock movement was taken apart. The mainspring was removed from the barrel. The mainspring end was broken. Fortunately, this can be repaired. A new mainspring does not have to be acquired.